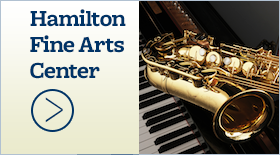 December 5, 2017 - Hamilton School District. Hamilton School Board members approved the 2018-19 school year calendar that coordinates spring break the last week in March with many other southeastern Wisconsin school districts. 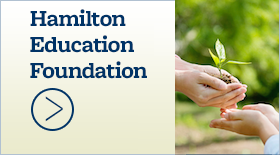 In September, Hamilton was among CESA #1 school districts that surveyed parents and staff to determine if there was support for a consistent spring break. 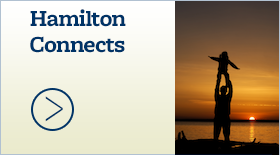 More than 85 percent of Hamilton parents and staff supported the coordinated consistent break as long as Easter had a 4-day weekend. 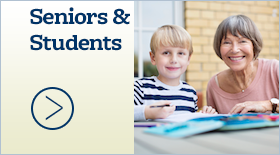 consistent spring breaks for families connected to more than one school district. Lannon Elementary School principal Brian Balfany updated the School Board on his school’s site plan progress. 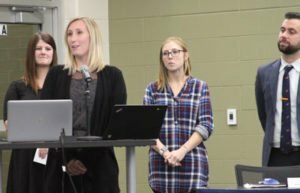 He introduced three new teachers — Briel Brugger, Amanda Rittich and Carli Schadeberg — who described what it has been like to be a new staff member at Lannon. Lannon staff members, from left, Briel Brugger, Amanda Rittich, Carli Schadeberg and Brian Balfany explained to School Board members how they use Readers’ Theater as an activity that encourages students to read. 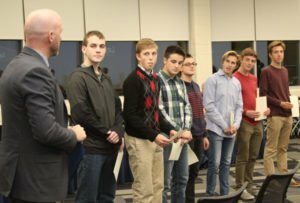 Members of the Hamilton High School Boys’ Cross Country team were recognized for success at state competition this year. Cross country coaches are Ben Nysse, Barb Lemke, Susan Smith and Stephen Schmidt. The Hamilton School Board ratified a contract with United Lakewood Educators (ULE) which represents district teachers. Under the contract, base salaries will increase by 1.26 percent for 2017-18, retroactive to the beginning of the school year. The tentative agreement was reached Nov. 30 between the district and ULE representatives and was expected to be presented to ULE members this week for a ratification vote. The increases do not apply to teachers on replacement contracts or plans of assistance. Retroactive pay is expected to be available to staff in December. approved the appointment of Sheila Heimermann as a Maple Avenue paraprofessional.